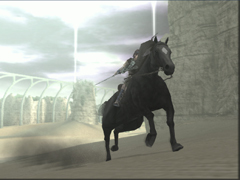 Climb aboard Agro and get behind the temple again, we are going to get to the 7th colossus now. Take the path to the north where the way parts. The one with the ruins of the old arch over the natural bridge (which you took every time by now). 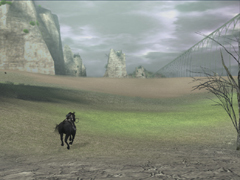 And at the end ignore the path to the second colossus again and ride straight on on the smaller path. Pass the mountains on your left and the ride on straight along the huge bridge over the wide and untouched land. After some time following the way of the bridge other mountains will appear to your left. Just ride straight on to the north. After some time even the mountains to your left disappear and another wide land opens up next to you. 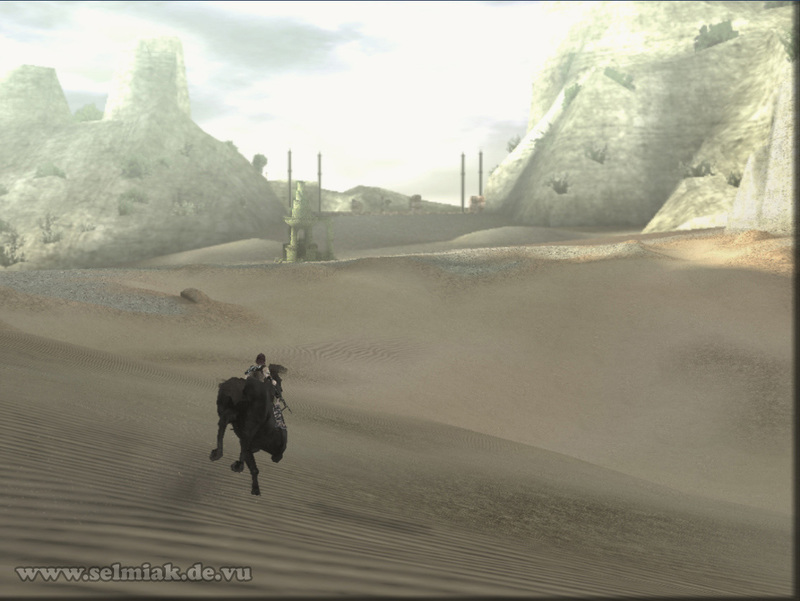 And this is where you turn to now, ride across the sandy plain to the left to the west until you reach the save shrine there. If you need to you can save your game here but you are almost there anyways. Just to the west of the save shrine is a wide staircase with a small entrance in the middle. This entrance leads you to the swimming pool of the 7th colossus. 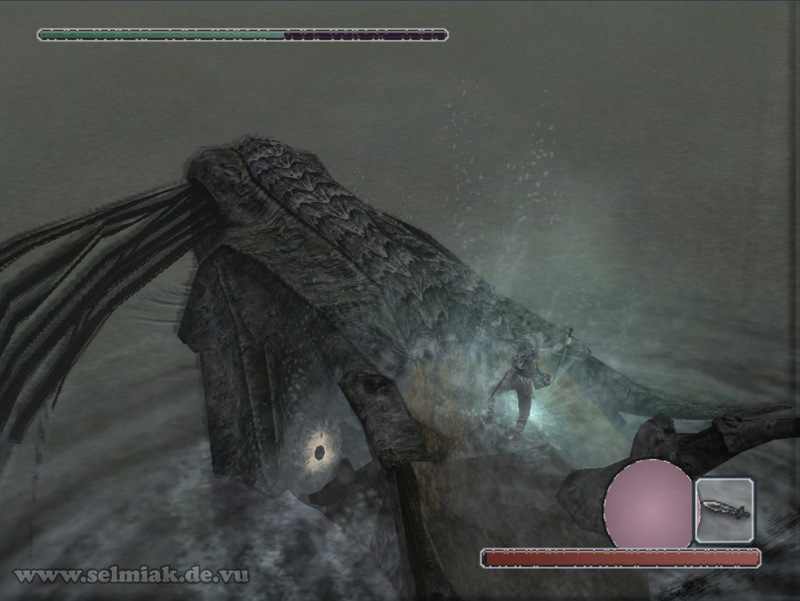 Well you are on your way to it, but you still have to jump into the dark, cold, lonely, silent water to find this water colossus. 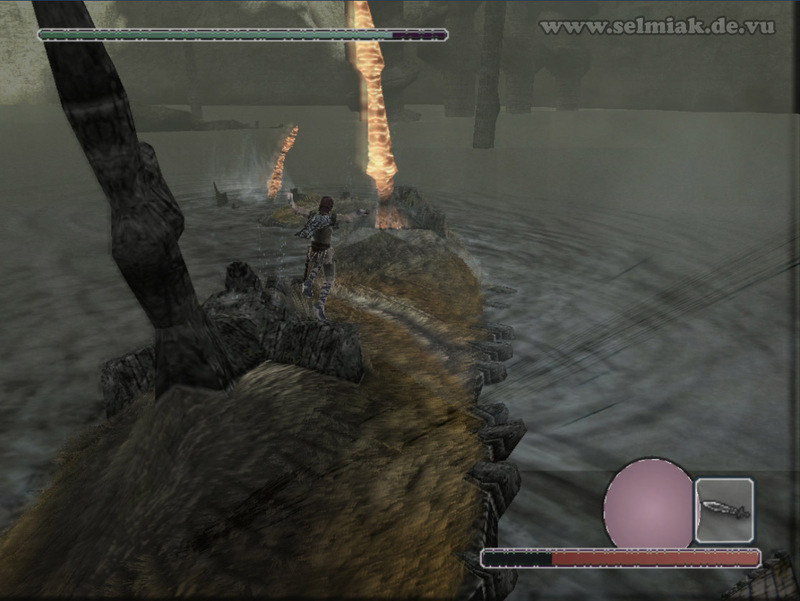 Sadly you cannot bring Agro with you to this fight because he doesn't like to jump down this kind of height and is also afraid of dark unknown waters. At least he told me so. So you are on your own again. Now it's time for fun in the water with the colossal giant leech who likes to stay underwater, the 7th colossus, so be a hero and jump into the dark and cold wet substance and take a look around. Look for a glow under the water and swim there. You can't dive as deep as the seventh colossus is swimming but if he is swimming below you just wait a few moments, his glowing spikes from his back are coming really close to you. If they are coming too close avoid them and swim away because they send out electrical impulses that are not good for your health. 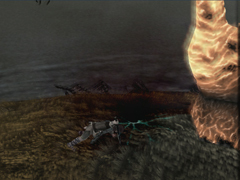 But don't swim away too far because once the 3 electro spikes are gone by the long tail of the colossus shows up and you have to grab onto it with all your power. Now you go for a hell of a ride like on a rollercoaster through the deep water and shortly before your oxygen runs out the colossus resurfaces again. Use this very opportunity to run towards his head and be prepared for him to dive down again. When the seventh colossus does dive down you will notice this by your feet getting wet and the colossus shaking around. So then grab onto his back again and hold on tight while you are under water. Once the colossus comes back up again you can run on again. But there is a catch to it. You do remember what I wrote about the electro spikes just now, don't you? Because they are electric and really mean, these spikes hurt you once you are close enough to them. Especially when they are partially under water as water conducts electricity. So once you are near one of these electro spikes grab the fur behind them and swing your sword into the nicely glowing small hurt point before the 7th colossus can dive down under water again. With this technique you can short circuit the electric spikes and get rid of the threat. 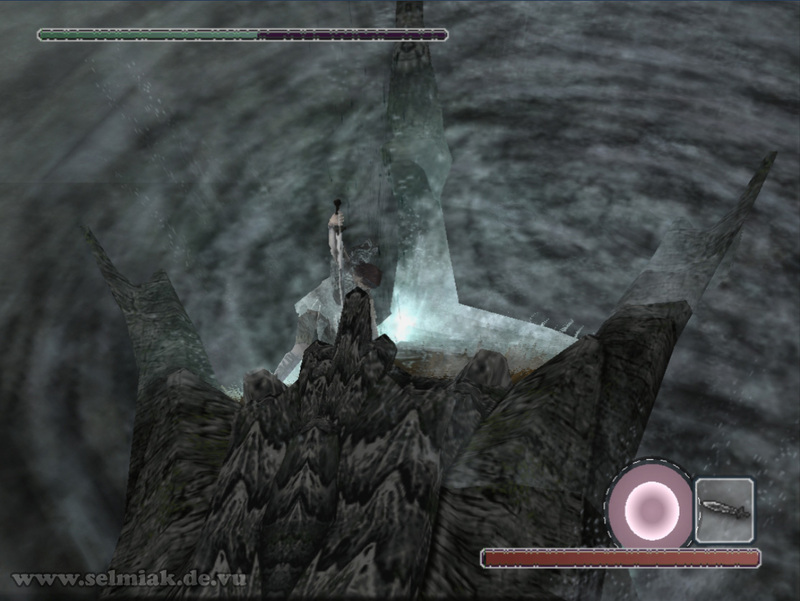 If you cannot hit the hurt point before the colossus dives down again try to get as far away from the still electric spike as possible, but still grab onto the fur. So if you are still too close to the electro spike you get a good blast of electricity and Wander doesn't like this, as his healthbar also doesn't. Use this technique to reach the head of the seventh colossus. 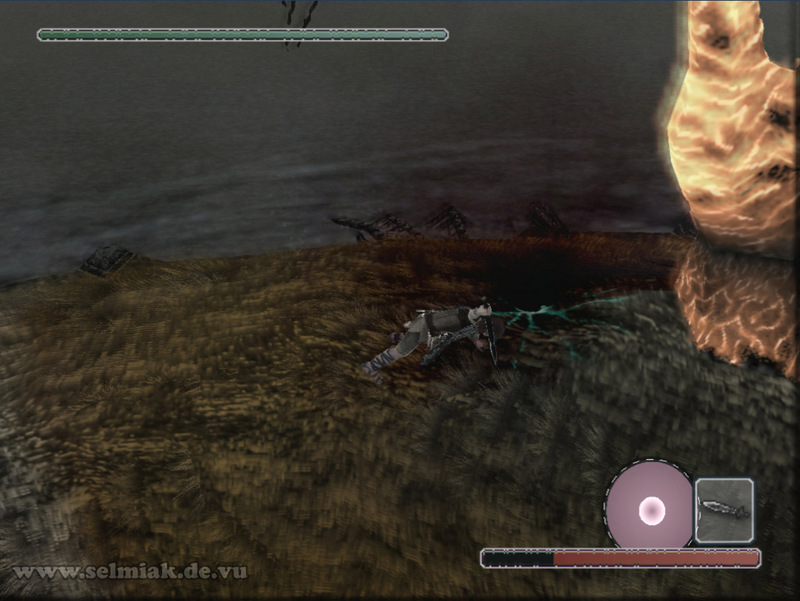 After killing the second electro spike you better wait a bit longer as the colossus likes to dive down for a longer time and force you to loosen your grab under water as you are running out of air (strangely enough Wander still manages to breath heavily without coughing under water if you listen close enough). But it's not a problem if you lose the huge leech, just wait a bit until the colossus reappears on the surface, grab his tail again and work you way on to the head. If you already killed all three electrospikes it is harder to see the colossus under water but he will come back every time, no matter what. 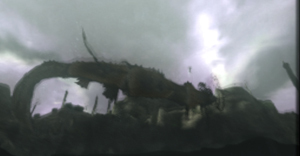 After getting rid of the last electro spike you have to walk on a bit to the head of the 7th colossus because now the final ornament appears on the head. Smash your sword into it until the colossus is finally done. 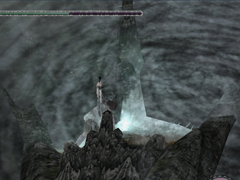 Because the colossus likes to dive down under water a lot once you are hanging on his head you should charge your sword sting power only a bit and then hit him with only 10-20% force. This is better than charging 100% and then only hitting the water with your charge. 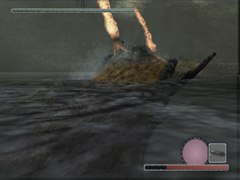 So start charging once the colossus is over water and hit him really fast. It only appears to you as if it takes longer because swordhits that only hit the water don't help at all and it takes even longer. So if it is going really wrong it could happen that the colossus dives down deep into the depth of the pond again, you have to dive back to the surface and wait for the colossus to reappear and get back all the way to his head to place one blow. These short blows are really faster and faster than the mentioned situation.